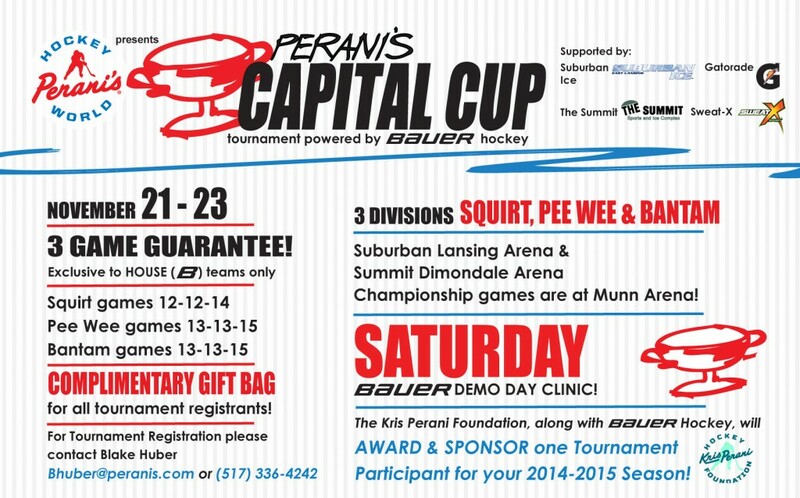 The Perani’s Hockey World Capital Cup is coming this fall! For the first time ever we are running a tournament that will take place at Suburban Lansing Arena & Summit Dimondale Arena with Championship games at Munn Arena! We are Powered by Bauer Hockey, supported by Sweat-X, Gatorade, Suburban Hockey and the local Lansing Ice Arenas! This is a “House/B” tournament only and it will be the most “Kid Friendly” tournament, and includes Squirt, Pee Wee and Bantam divisions. Registration fee will be $550 per team and will come with a 3 game guarantee. Contact Blake Huber at bhuber@peranis.com or call (517) 336-4242 for more information.